While a key component of artificially supporting the dollar, precious metals manipulation pales in size compared to the bullion banks' shenanigans in interest rate swaps. The fact that the US gov't keeps treasury rates artificially low via massive interest rate swap derivatives has been well documented here. The size of JPMorgan's IR swap book alone IS MORE THAN THE ENTIRE WORLD GDP! In a story with enormous ramifications that has gone almost unnoticed, an unnamed Canadian bank yesterday has filed suit against at least seven firms including JP Morgan over conspiracy to manipulate the price of interest rate swap derivatives for more than three years. After discussing the Canadian bank suit, we look deeper into the IR swap market, how it is used by The Fed to suppress interest rates, and why gold and silver are suppressed to keep this charade going. Bloomberg:JPMorgan Chase & Co., Deutsche Bank AG (DBK) and HSBC Holdings Plc (HSBA) are among at least seven firms accused by another bank of participating in a conspiracy to manipulate the price of derivatives worldwide for more than three years. The unnamed bank, seeking immunity, told Canada’s Competition Bureau that traders and cash brokers conspired to influence the Yen London interbank offered rate from 2007 to 2010 to profit on interest-rate derivative positions linked to the benchmark. The bureau spelled out the probe in documents it filed with the Ontario Superior Court in May. The documents, shown yesterday to Bloomberg News by court clerks, offer one of the most detailed accounts yet as watchdogs in Europe, Asia and the U.S. look into concerns that firms conspired to manipulate interest rates serving as benchmarks for trillions of dollars of financial products. Canada also is investigating Citigroup Inc. (C), Royal Bank of Scotland Group Plc (RBS), ICAP Plc (IAP) and RP Martin Holdings Ltd., the court documents show. As of 2007, our friends at JP Morgan held $61.53 TRILLION in total OTC swap derivatives. BOA was a distant 2nd at $23 Trillion, with Citibank in 3rd at $19.9 Trillion, and HSBC at $2.1 Trillion. Wachovia rounded out the list with $3.1 Trillion in OTC swaps, so we can assume that is now on Wells Fargo's books. Combined, the top 5 banks held $110 TRILLION IN OTC SWAPS as of 2007...which has likely increased significantly in size over the past 5 years as the financial system teeters on the verge of collapse. $110 TRILLION! 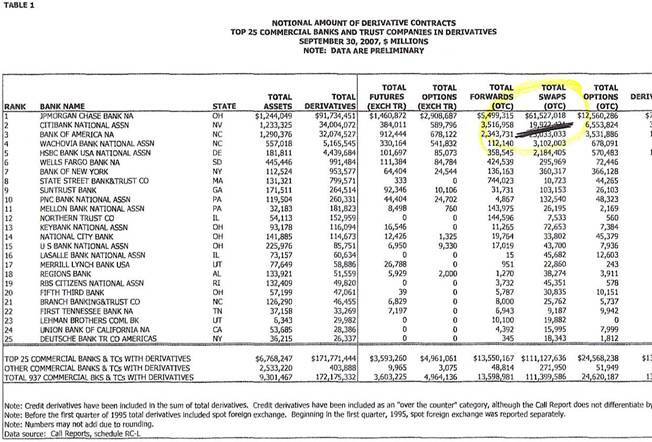 The next top 20 banks held a mere $1 Trillion in OTC swaps-combined! Of this $111 Trillion, an astonishing 65%, of these books are Interest Rate (IR) Swaps. IR swaps artificially support the bond market by creating massive demand for bond trades that are embedded into these swaps. Thus, this massive trading of OTC IR swap derivatives creates massive artificial demand (no end user is purchasing the bond...this is merely trading for trading's sake), which results in an artificially high price for said bonds, which means interest rates are suppressed and kept at severely and artificially low rates. This is how you can see 3.5% 30 year rates when actual inflation is running 8-10% annually- massive artificial demand for bonds due to unimaginable volume of IR swap OTC's trading back and forth among the treasury's proxies JPM, Citi, HSBC, etc. Rob Kirby has documented that JPMorgan's IR swap book alone requires $41.4 BILLION in bond purchases PER DAY in order to properly hedge the growth in these swap books, plus an additional $30.3 BILLION in bond purchases PER DAY to hedge maturing IR swaps that need to be rolled-over and replaced- just to keep a static book. Kirby documented that just during Q4 of 2007, JPMorgan alone required $71 Billion worth of bonds daily just to hedge its IR swap book. According to the US Treasury, during Q3 of 2007 the Treasury required a total of $105 Billion in debt borrowings. Assuming the treasury sold 100% of its Q3 2007 offerings to JPMorgan, $105 Billion would satisfy about a day and a half of hedging requirements for JPM's swap book. Clearly it is physically impossible for JPM to be hedging this type of volume. Need any further proof that JPM is The Fed? Now do you better understand why gold and silver are suppressed, as they would otherwise blow the whistle on this whole game!?! If/when gold and silver are allowed to rise to their manipulated, free-market values, JPM's entire circus comes crashing down. At $61.53 Trillion, this WOULD WITHOUT QUESTION take down the entire financial system. Still expect the CFTC to do anything to force JP Morgan to cease manipulating gold and silver? We didn't think so.